This guy is my napping hero! Some people can lie down, actually pass out, and wake up fifteen minutes later, refreshed like they had an entire night’s sleep and ready to conquer. I can’t do fifteen minutes, for one. Sometimes it takes me that long to just start to nap. I feel a sense of anxiety that I can’t get rid of so I usually give up at that point. I don’t have this issue falling asleep at night, but if the sun’s out I have daytime insomnia. 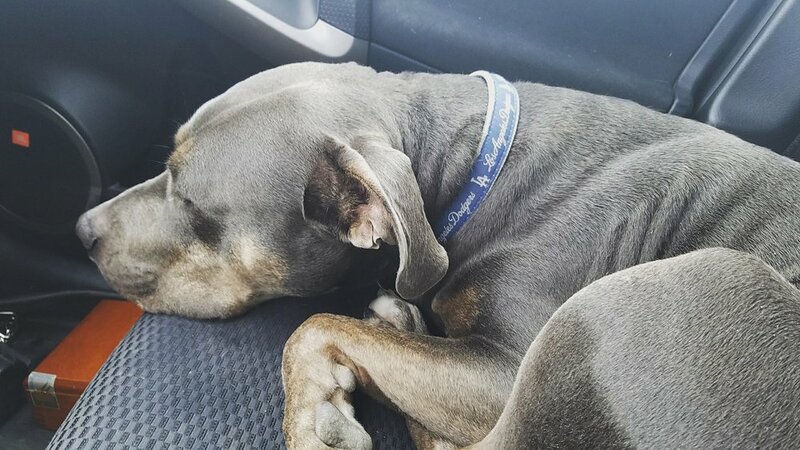 Dog nap in the car. And for another, if I do manage to fall asleep during the day, fifteen minutes does nothing for me. I wake up at best, feeling discombobulated and at worst, angry. Like really angry. I guess at having to be awake? So if I’m going to do a nap I have to set hours aside and then still, usually I wake up feeling sluggish and disoriented, and it takes me awhile to feel a part of the waking world again. So, usually, I just don’t nap. I know I’m not good at it. It does nothing positive for me. So if I’m tired I simply power through until bedtime and knock out for a full night’s rest. That being said, today I think I’m going to give it another shot. I’m tired. Good tired. It’s been an amazing week of opportunities, spending time with awesome folks, and creating. Everything’s been so fun and I’m incredibly grateful and happy, but I’m also supremely exhausted. I had to give up something this week to make it all happen and sleep drew the short end of the stick. Ironically, while I don’t do well with napping, I also don’t do well with a lack of sleep. And since I have plans tonight, I don’t know if I can make it until whenever bedtime occurs before lying my head on a pillow. Dog napping in his bed. Overall, I’m trying to be better about asking myself what I need and following through no matter what else may try to get in the way. Another irony, since I’m writing a blog post about this instead of napping. But I have a phone meeting I don’t want to be groggy for so I’m powering through with the help of apples and decaffeinated green tea (Possibly defeating the purpose?). So what I need as soon as my “work day” is complete is a solid nap. I talk more about body scans in this blog post, but I’ve never made it to the end of a long enough guided one. The 45 minute ones on Youtube do me in every time. Sometimes you just have to be tired enough. You might not have physical energy, but that doesn’t necessarily mean you’re needing sleep tired. You might be tired for some other reason. You’re feeling sad or depressed or burnt out. You might need some exercise, a chat with a friend, or finish some project, whatever lifts your mood. Dog napping in what he thinks is his bed. This is also where the body scan helps, but the constant line of thoughts and worries create anxiety, which is the best of all sleep killers. And often the worry is that you won’t fall asleep. Figure out a way to stop the worries. Focus on your breath or how you feel in your body, read a really boring book, tell yourself you’re the best napper in the entire world until you really believe it, whatever you’ve got to do. When all else fails, don’t fight it. Fighting it only makes it worse. Do something else relaxing like take a bath, meditate, do yoga. Maybe you’ll just happen to wake up from a surprise nap. All right folks, fingers crossed I can get a quick-ish nap in and hope the same for all of you. Or whatever your wise self tells you that you need today (Sometimes that isn’t a nap for those of you who nap too much! ).